The Huawei MediaPad M5 Lite 10 is a upper-middleclass tablet with a full HD display, an octa-core processor and Android 8.0 Oreo. Its main highlights are four build-in speakers and stylus support. The pen is called M Pen Lite. Here is everything you should know about the Huawei MediaPad M5 Lite 10 including its specifications, price and possible alternatives. The Huawei MediaPad M5 Lite 10 is like its MediaPad M3 Lite 10 predecessor an upper-middleclass tablet. It offers a 7.7 millimeters thin full metal body with two speakers on the top and two speakers on the button. So, in total, the tablet has four speakers. We also get a USB C connector, a standard headphone jack and a microSD card slot. Both cameras have a resolution of 8 megapixels. Another important feature is its fingerprint sensor which is located underneath the screen. Using that fingerprint reader you can unlock the device easily, but also replace the standard home, back and recent apps buttons using gestures. The Huawei MediaPad M5 Lite 10 has a 10.1-inch IPS display with a full HD resolution of 1920 x 1200 pixels. Like most of its competitors, the screen has an aspect ratio of 16:10. Underneath the touchscreens runs a HiSilicon Kirin 659 octa-core processor together with 3GB of RAM and a 32GB internal storage. Other hardware features include Wi-Fi 802.11 ac, Bluetooth 4.2 and optional 4G LTE and GPS. While the MediaPad M5 Lite 10 is not that light with a weight of 475 grams, it houses a very large battery with a capacity of 7500mAh. One of the accessories for the Huawei MediaPad M5 Lite 10 is the M Pen Lite. While it is similar to the standard M Pen of the pricier MediaPad M5 Pro, it supports 2048 levels of pressure sensitivity only. Its more expensive brother has twice as many pressure levels. However, 2048 are fine for almost everybody. Huawei is shipping the MediaPad M5 Lite 10 with Android 8.0 Oreo. That means it is running the same operating system as all current Huawei tablets. However, I think it is unlikely this device will ever get an update to Android 9.0 Pie. In the past, Huawei has not been that great with timely updates. On top of Android runs the EMUI in version 8.0. That is the own interface from Huawei. EMUI stands short for Emotion UI. With that interface, Android is customized quite heavily. For example, there is no app drawer anymore. Instead, all apps are installed onto the home screen directly. But don’t worry. In fact, it is quite easy to customize yourself. Huawei announced the MediaPad M5 Lite 10 in August 2018 for the European market. But I am certain it will be released in the United States and Asian countries like Taiwan, India or Thailand as well. In Europe, prices start at 299 Euros for the Wi-Fi version. You can get the 4G model starting at 349 Euros. There are a couple of interesting alternatives to the Huawei MediaPad M5 Lite 10. An obvious one you might want to check out is the Huawei MediaPad T5 10. While the body, internal hardware and even the display are very similar, the T5 10 is missing a couple of premium features. It has two speakers only, no stylus support and no fingerprint sensor. However, it is much cheaper too. A noticeable step up is the Huawei MediaPad M5 10 (review). It costs a bit more but features a higher-resolution screen and a much faster processor. Two other tablets are worth mentioning. You might want to check out the Apple iPad 2018 (review). While it usually costs a bit more, the performance is a bit better. However, it has two speakers only and the screen is not laminated. Another alternative is the Samsung Galaxy Tab A 10.5. Both tablets costs about the same, but Samsung’s is a bit weaker. But you still might want to check it out. In the past, Samsung has been much better with updates than Huawei. 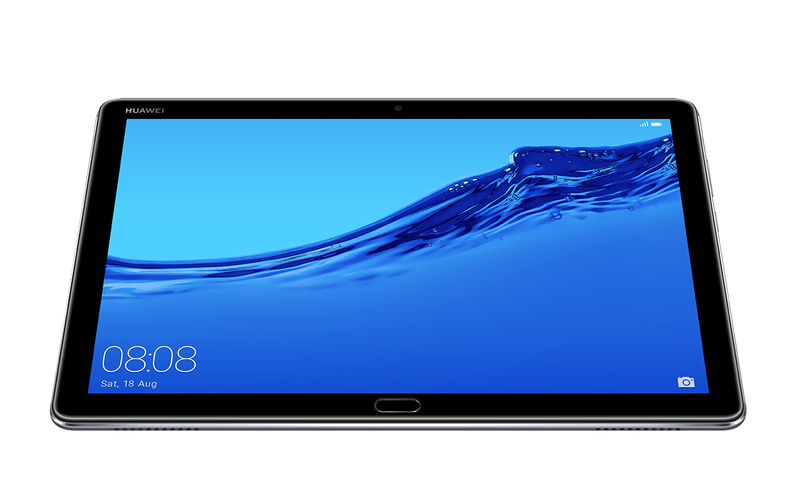 The Huawei MediaPad M5 Lite 10 offers a great value. Even though it is quite affordable, it features a 10.1-inch full HD display, a fast processor and a great build quality. In addition to that, it offers a lot of premium features like four speakers, a fingerprint sensor, and an optional stylus. The battery life is excellent too.